One year old Willow Scanlan was born with a heart defect and recently received life-saving surgery to repair her heart. She is pictured with Dad David, Mum Gina and son Jude, 4. Picture by Colin Rennie. For most parents, celebrating their child’s first birthday is the culmination of twelve months of happy moments and precious memories. 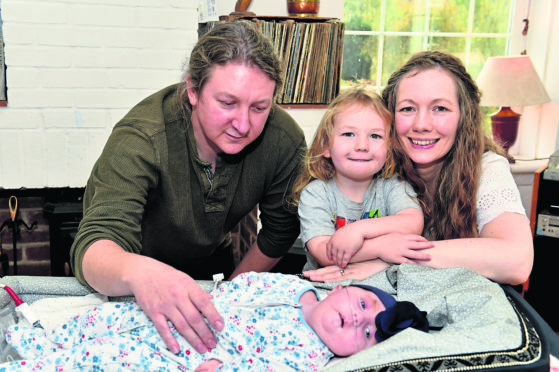 For David and Gina Scanlan it has been a roller-coaster of emotions which has happily resulted them welcoming their daughter home following surgery to fix the hole in her heart. Willow was born with the heart defect and was later diagnosed with Trisomy 18, also known as Edwards Syndrome. Her parents had to fight for Willow to receive the life-lengthening operation after they were initially told it was not usual clinical practice for children with her condition to get the cardiac surgery. But following a referral to NHS England, where doctors in Bristol agreed to give Willow the surgery, surgeons in Glasgow decided to operate on Willow after all. The operation was carried out on June 11 at Glasgow’s Royal Children’s hospital. Willow had to spend several weeks there in the intensive care ward, but was later allowed to move into the Children Hospices Across Scotland (CHAS) Robin house hospice in Balloch – along with her parents and big brother Jude, 4. The family returned home to their house near Fyvie last week after spending eight months living in Glasgow and now feel “thankful” for all the help they have received along the way. Mrs Scanlan said: “Being able to stay together in the CHAS hospice was just amazing – we are so grateful and thankful to everyone involved. “We had our own apartment which had access to the garden – it meant that Willow got to have days in the sunshine with us. Looking back on the last year, Mr Scanlan says the couple were “not bitter” and added: “We had to fight for her. “If we had just given up and agreed with the doctors to not go ahead – then we would always be wondering if we had done all we could possibly have done.